It has been 18 years and 129 days since the city’s pledge to build the West Branch Library. This month we celebrated the fifth year of our Koi pond. We left the shade screen over the top all winter and it didn’t seem to hurt. So we will leave it up until it deteriorates. So far we have used it for 2 years and it is holding up well. burrowed under the pond’s rubber liner and removed it all. We are leaving a small patch of Taro on the right. If it starts to become too invasive and we can’t control it, we will remove it as well. I also removed a large tub of Iris in the center of the pond. It didn’t bloom this year and its height impeded a comfortable view of the large waterfall and pond. Once again, I left a smaller patch of Iris that sits in a pot on top of the fish shelter. It bloomed profusely this year with at least two dozen blooms. Beautiful! a yellow hibiscus, yellow canna lily and some small plants, some with red flowers and some with yellow flowers to add more color to the island. Alas, the large Agave rotted and died. We decided not to replace it as it made it too difficult to maneuver on the island. Our external, four barrel adjunct filter system is doing a fantastic job. It just keeps chugging along and keeps the water quite clear. I still add a mesh, laundry bag of barley to the pond every month or two. As the barley decays it releases a substance that kills algae. food once a day, they spend a great deal of time foraging on algae that persists on the submerged rocks. I also periodically (when I think about it) make a small ball of bentonite clay, throw it on a pot shelf and watch the Koi attack it. They seem to love it. From time to time, not frequently, I do use some Algae Fix to keep the level of algae down. We also spend some time hand removing string algae. It seems to love the small stream that meanders around a portion of the pond. 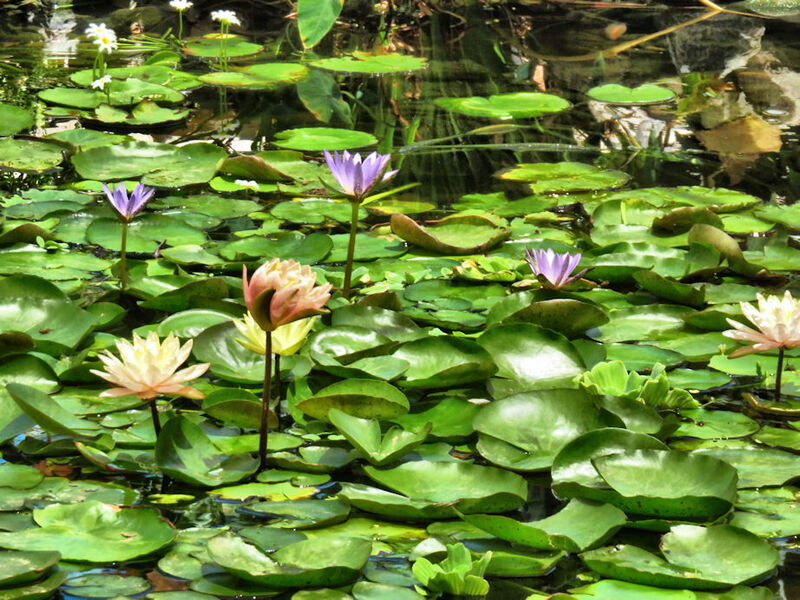 There is always maintenance: trimming of the vegetation surrounding the pond, removal of decaying lily leaves and removing string algae. But all is a labor of love. This time of year, March and April, is Arizona’s spring, with several days of flirtation in the 90’s. Everything is in bloom, vibrant and colorful. This time of year we spend a great deal of time outside, enjoying Koi antics. It has been 17 years and 217 days since the city’s pledge to build the West Branch Library. I haven’t done an update on the pond in awhile and it seemed like a good time to share how it and the Koi are doing. It’s early August and HOT. I was in the pond last week doing some trimming and cleanup work with the pond plants. Surprisingly, the water is much cooler than the ambient air temperature and the fish seem to enjoy it. I am convinced that the shade cover is doing its job. The shade cover, the UV light, the barley bale and a very occasional dose of Algae Fix are keeping the algae down considerably. I’ve blogged about the shade cover and the UV light previously but I don’t think I’ve ever mentioned the barley bale or the use of Algae Fix. retards algae formation. I take a mesh laundry bag (you can get them at a Dollar store for $1 each), fill it with barley straw and then insert it all into a second mesh bag. Add a string for easy retrieval and anchor the string around a rock. At first the barley mesh bag floats for about a week. Eventually it gets water logged and sinks to the bottom. As the barley decomposes it releases a natural chemical that retards algae development. The barley will virtually disappear over time. When the bag is empty I pull it and refill. I use barley in Arizona in the spring, summer and fall. As for the Algae Fix I use it sparingly. In May the algae went wild and I was hand pulling pounds of it out of the pond daily. Yes, daily. I finally realized that I would need to use something to get a handle on the algae situation. I used the Algae Fix every 3 days as directed over two weeks. The algae disappeared considerably…not all of it but a good 80%. In July I started to put a cup in once a week and it has kept it under control. I still hand pull algae but not every day and not in the copious quantities I had been pulling. gain strength. I then planted them in pots and set them in the pond. Every plant died. I have no clue as to why. I then ordered two Lotus plants and potted them this spring. Guess what? They died as well. I guess this pond is never destined to enjoy Lotus. 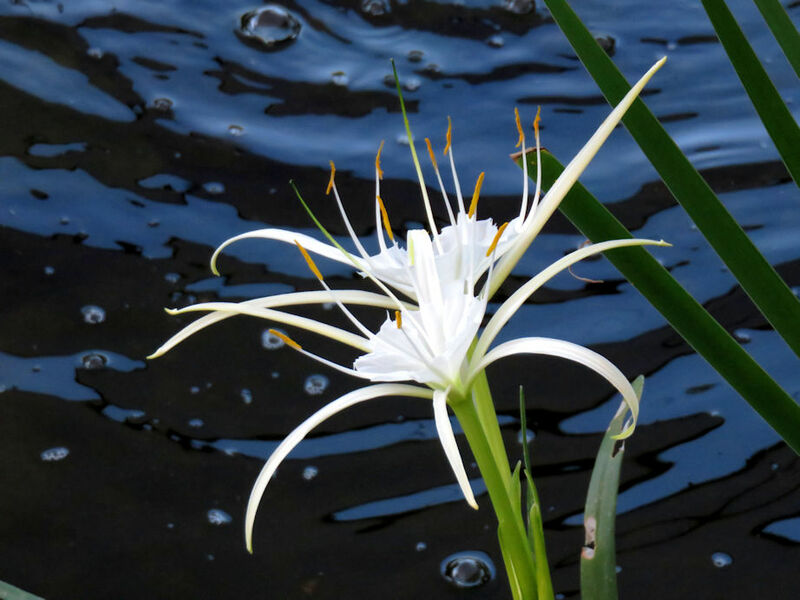 I also ordered two Spider Lilly plants. They have done well and bloomed this spring. culling Snowflake and Water Lettuce all the time. Both plants are very, very prolific and would take over the pond if I let them. The same can be said for Yerba Manza and my Taro plants. I finally ripped out the Yerba Manza but there is still one patch left that I will dispose of. The Taro has multiplied and now resides in two spots in the pond. The Iris is finished for the year and I have cut the leaves back so that they don’t obstruct the view within the pond. 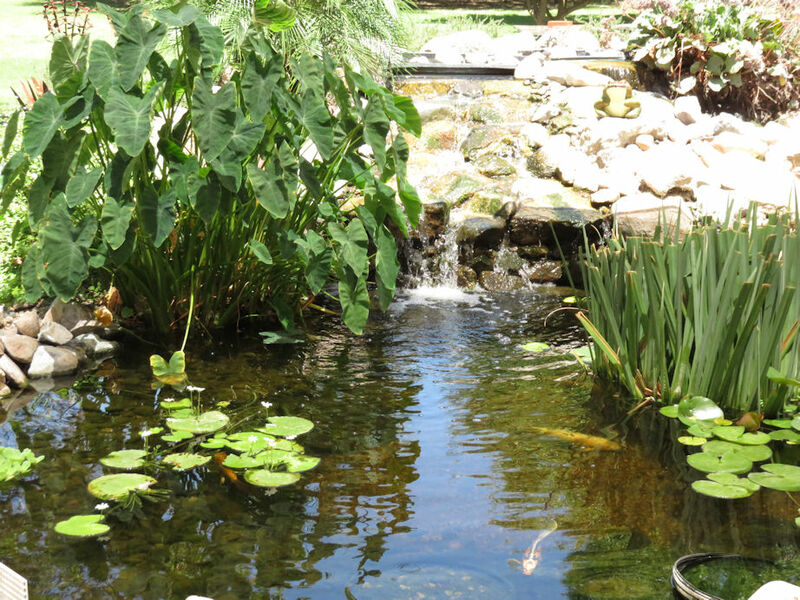 Even though temperatures are soaring in Arizona the pond is happy and healthy and so are the Koi. We still sit outside every evening after dinner, feed the Koi and enjoy their antics. The pond has given us countless hours of enjoyment and well worth our investment.